This movie is rated P-13 and may not be appropriate for all ages. Avengers: Age of Ultron is an exciting sequel to the blockbuster film, The Avengers. 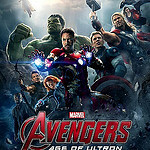 It follows Iron-Man(Robert Downey Jr.), Thor (Chris Hensworth), Captain America (Chris Evans),The Hulk (Mark Ruffalo), Black Widow (Scarlett Johansson), Hawkeye (Jeremy Renner), Quicksilver (Aaron Taylor-Johnson), and Scarlet Witch (Elizabeth Olsen) through their adventures to stop the evil robot that was created by Iron-Man in his attempt to protect the world. Thankfully, Age of Ultron is not a carbon copy of the first movie. Many changes were made, including new cast members and an intense new supervillain, and the story dives deeper into the human aspects of our superheroes. Also in this film, there is non-stop action that will keep the audience on the edge of their seats. There is a considerable amount of violence, but it is mostly kept to a comic book feel, and does not become too graphic. Keeping true to the Marvel style, Age of Ultron is full of comedy that keeps the movie light-hearted and fun. As usual, the actors do a wonderful job portraying the ever so complicated characters. They show the human and vulnerable sides of their characters. This allows the audience to relate to them. With amazing special effects, very exciting suspense, and several twists and turns in the plot, it will be very hard not become interested in this film. But, halfway through it does seem to become a bit redundant, and it does not seem to progress much. But, the epic battle scene to conclude the movie is very intriguing, and captures the audiences’ interest once again. Overall, Avengers: Age of Ultron, is an exciting, funny, and adventurous movie that is an excellent film for a family to enjoy.